The Importance of Metadata and How Yoast Makes it Easy! When you think about what makes up SEO your website’s metadata is a very important factor. You are telling search engines “I’m not only awesome at what I do, but I am REALLY good at making an excellent first impression.” In the grand scheme of things, that is what metadata does for you. It allows you to give your next potential client, customer, or shopper a sneak peek of what you have to offer. Metadata brings that organic fuel into your business, as long as you have all your ducks in a row. For anyone who is fresh in the world of SEO, don’t worry you are not alone! Metadata is the information displayed in search engines results page (SERP) that reflects the greatness that is your business and the services you offer, by utilizing your results from keyword research of course! The funny thing about metadata, and Google specifically, is because of their ever-changing algorithms and updates, the character display requirements change frequently. Also, like any other SEO task, NOTHING is one and done. You should test different keywords and descriptions to see what is most effective. Luckily there are amazing tools out there like Yoast, a WordPress plugin, that make it nearly effortless to change the metadata, and I will let you in on a little secret….it is FREE!!! Yes, they have a premium edition you can purchase, but dive a little deeper and I will show you the difference between the two. Have you ever been to a website and noticed a weird URL after the domain containing alphanumeric characters or not relevant to the content on the page? This part of the URL sometimes referred to as a “slug,” should be optimized by keywords just as your header tags, page title, and other content would. When you are developing your website or about to publish a new blog don’t feel like you need to rush in creating the URL for that page. Utilize your keyword research to make sure the URL is unique and matches the searchers intent will score you points with search engines. Every website page URL is displayed on SERPs (as long as you have allowed your website to be indexed.) So, you want users to see relevant keywords in various aspects of your metadata and website content. Sometime during the web development stage and the launch, take time to do some keyword research for your domain “slugs.” You can always change these if you REALLY want to, just make sure you create a redirect so if you have a link out there that you have changed, the user will be directed to the new website URL or page you created in its place. Which leads me into one stellar feature of Yoast Premium. If you ever need to change a URL Yoast Premium will prompt you to accept an automatic redirect, or you can navigate to the “SEO Yoast” tab of your WordPress dashboard and create all kinds of redirects. Redirects are a permanent or temporary function that sends a user from one URL to another automatically for various reasons. Don’t get me wrong, there are sometimes when redirects are necessary, but lack of keyword research for your URL is not a good reason if you ask me. 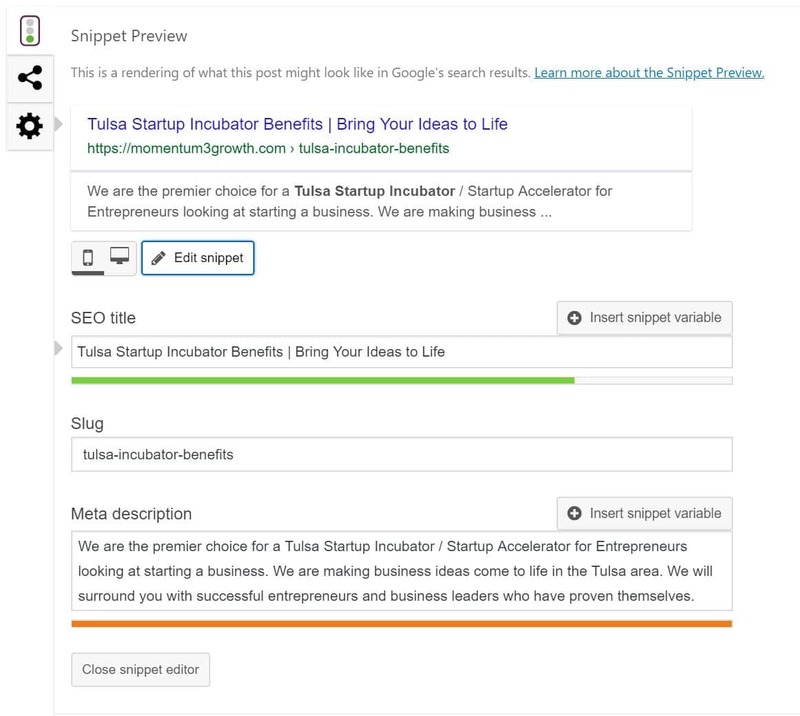 When it comes to plugging in the metadata for search engines results, Yoast plugin makes it easy to be customizable by allowing you to edit the title tag, description, and even the slug if you choose to do so. The green line indicates you are within the character display limit, and if it is orange you either have too many characters or too little. In case you were wondering, search engines see all the content of metadata regardless of where you are in the story of “Goldilocks and the Three Bears.” But we all know what Goldilocks (a.k.a search engine users) like. To appease the eye (or the tastes buds of Goldilocks) you want to make sure your metadata is just right. It is best to stay within the character limits of the SEPRs, which change every so often. 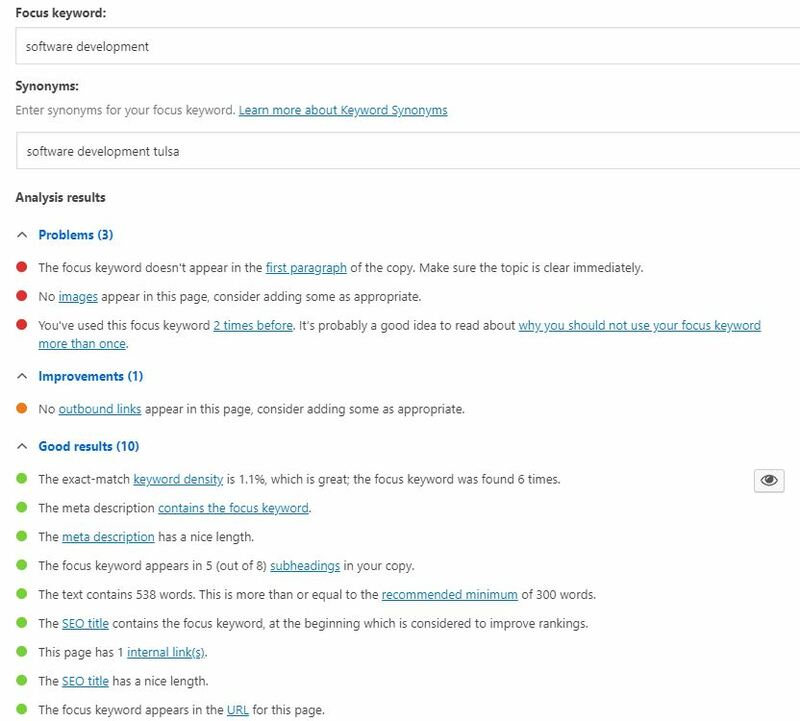 Once you have plugged in your metadata, Yoast has a feature where you can test keyword optimization based on the content on your page and what you have placed in your metadata. 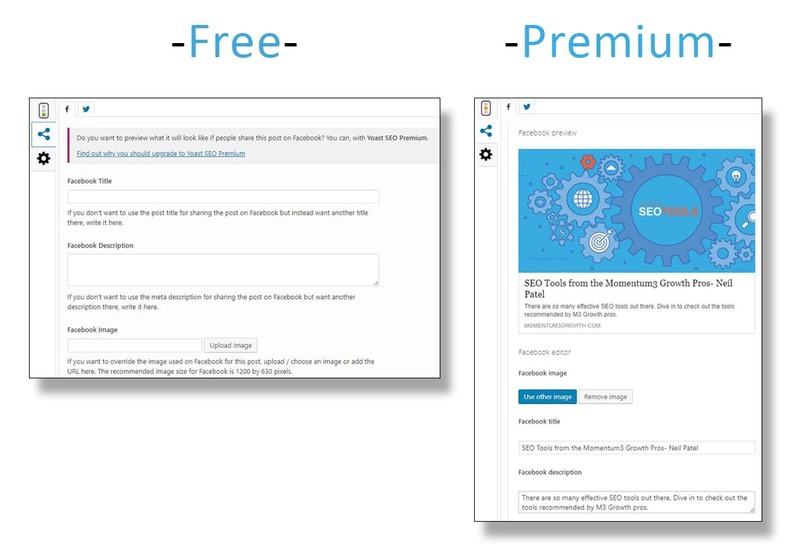 The free version of Yoast allows you to test 1 keyword at a time, whereas the premium version tests up to 5 keywords at a time, so you can make sure all your bases of keywords are covered. This will help ensure proper optimization to increase organic traffic. Having keywords in the correct places is so important, and Yoast breaks down keyword density, header tags, readability suggestions and more. Take these suggestions and implement them to your pages and see your organic rankings increase. That is not where the greatness of Yoast ends either. They have full Google connects with the ability to verify your Search Console, adjust search engine appearance, bulk editors to edit category, tag and portfolio metadata all at once, file editors to manage robot.txt (the indicator that tells search engines what pages to index and links to follow) and .htaccess file, social media link appearance, and manual redirects. One of my favorite features mentioned above is the social media link appearance. You have a website so you can get traffic to it, right? If you are not using social media to share your website content, whether it is a page, special offer or blog post, be sure to contact Momentum3 Growth to consult how to manage your social media to fuel business. We use A LOT of social media platforms at M3, and we have learned not all are as easy and customizable as LinkedIn website posts. LinkedIn allows you to edit the featured image in the post and the metadata before you post it. Unfortunately, Facebook and Twitter have not included this post feature, but don’t worry, that’s where Yoast comes in! Depending on if you are using the Free or Premier option you can either plug in the feature image and data you want and visually see the post before publishing it on social media, or you can manually plug it in and see the results when you post on your page. Either way, you know your users will see the information that you want to present about the page you are posting about, and not relying on Facebook to handle the way your business is presented (because we all know how they have had questionable intentions in the past.) See the different display options of free vs premium below. Every single page, post, category, tag and portfolio item of your website is displayed within search engines results with the proper robot.txt indicator. If you have a large website and are utilizing tags and categories you will have a lot of metadata to plug in. Another feature that I love to use when it comes to time efficient one-time SEO is the search appearance section. Navigating to the “taxonomies” section you are able to plug in metadata that will display on all your categories, tags, portfolio items and more. In case you were wondering, this is offered with the free version. 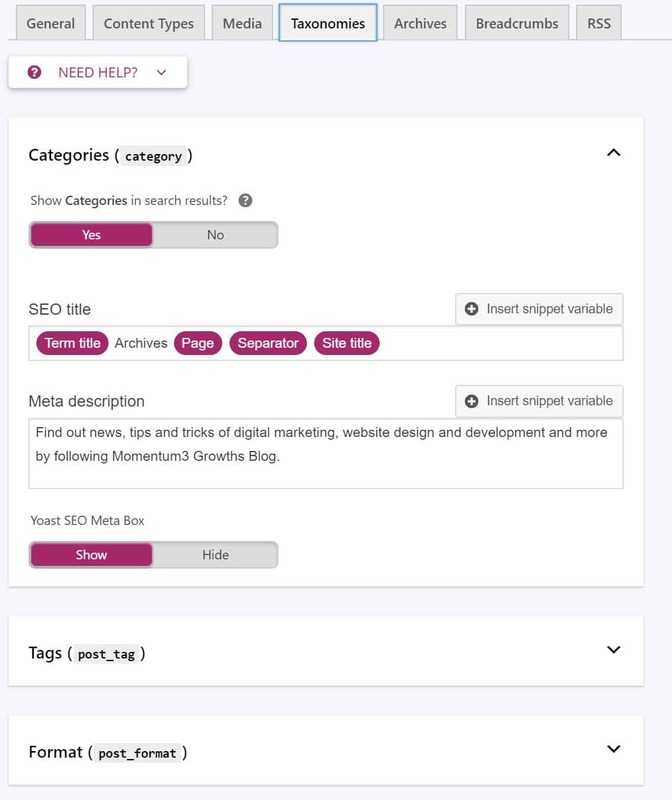 Don’t get me wrong, I still think it is great practice to go into each individual categories, tag, and portfolio and customize the metadata, but Yoast makes it easy to make sure you cover your bases for the basic necessities. Like the Moz edition and Neil Patel blog we published, there are SO many features of Yoast that we haven’t covered. It really is a tool that you need to dive in and use with all of your WordPress sites. Make your first impression of your business easy with awesome SEO tools like Yoast. For more information on killer tools and other Momentum3 Growth insights, be sure to follow us on Facebook and LinkedIn and subscribe to our blog page by allowing notifications when the popup is prompted!